To design and construct a class A single transistor power amplifier. Then to take readings from the amplifier concerning it's operation. 2) Measure VB, and VC. 3) Apply a 1KHz signal to the input and maximize the input using the oscilloscope as a reference. 4) Measure the voltage at the output, source, and base. 5) Add a 1KW load resistor across the output. 6) Repeat steps 3 and 4. 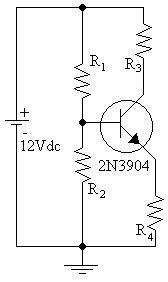 1)	Q:	What is the theoretical values for the gain and efficiency with this circuit? 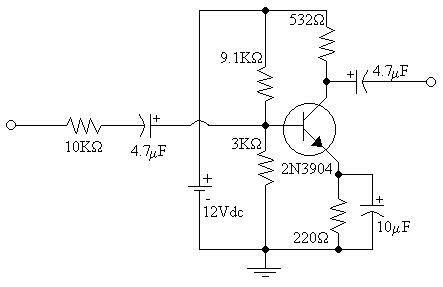 2)	Q:	What are the actual values of gain and efficiency for this circuit? 3)	Q: Compare the theoretical and actual values. From this lab a simple power amplifier can be built to conform to a basic set of operational standards. However, I do not know the source of the exceptionally large amount of error between the theoretical values and the real ones. I did, however, find it interesting that wave form that occurs at the emitter of the transistor. The wave form was identical to that of the base, only slightly smaller.